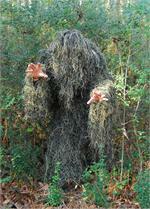 This is the place for your Ghillie Suit Supplies and KITS! We Accept Government Impac Cards! Our suits and method of manufacture are Patented. Web site last updated 01/07/19. NEW Backpack Tent with Ghillie Cover! The Tent Ghillie covers: are built on a Polyester knotted netting with 1” x 1” holes. Synthetic threads are hand tied to the netting. With the netting, you can add local vegetation when out in the field. Throw leaves or sticks on the cover to enhance it’s appearance and to help blend in to your environment. Backpack Tent Specifications: (3 Man Tent) has a zippered door with two windows on the door. Each of the three other sides has two windows for a total of 8 windows. On the 3 sides opposite the door, there is a larger zippered flap that can be opened for better viewing. All windows have two headed zippers. Included are, 2 folding fiberglass poles for support, 8 metal stakes with 4 ropes, and Velcro straps to secure the Ghillie cover. Tent cover is 150D, Water-proof PU black coating on the inside, and fire-retardant. Tent size is 5 1/2 feet by 5 1/2 feet, with an internal height of 6 feet 4 inches. The tent is made with metal rings that allow the unit to be twisted and folded up, and stored in it’s included backpack bag. The bag has shoulders straps for easy transporting into the field. All the included accessories are stored in the bag. The Ghillie cover comes in it's own storage bag, made from the same 150D water-proof PU material the Tent is made from. 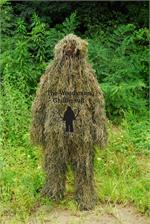 Kids Ghillie Suit. 4 Piece - Zippered Jacket, Pants, Hood, Rifle wrap.